A lot of stuff to share this week. Almost a flood! New MIB 3 Trailer. This is going to be a blast!!! For those who like Steampunk, here's a tantalizing bit for The Nightmare Machine Convention in Jefferson, TX March 30-April 1. Have to admit it's a nice gimmick! Star Wars The Old Republic - Times Squares Freeze Mob 12.20.11. This is just so COOL!!! Choose a side. GI Joe 2 Trailer - please, please, please let them have fixed Snake Eyes costume!!!! No weird creepy mouth thing. A Thousand Words Trailer - looks too darn cute! Hee! 85 Dancers From 22 Countries Stitched Into One Composite Music Video, article by Peta Pixel. Too Cute! And the song is catchy too. Time-Lapse Growth of Las Vegas As Seen Through Space Photos from Peta Pixel and NASA. 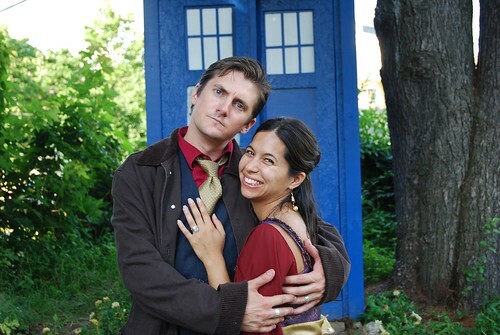 Totally stumbled over this by accident - Brenda & Rob's Sci-fi, Eco Wedding With A Tardis! lol. Over at Offbeat Bride. Too cute! Ice Age 4 Official Trailer! YES! Give me some Scrat! Despicable Me 2 Trailer!!! And how much do you bet it'll be in 3D? Hee! Jeff Strand is nuts! So it figures the book trailer for his latest work would be too. And also has a catchy song! lol. A Bad Day For Voodoo! The Cabin In The Woods trailer. I should have known with Joss Whedon involved it wouldn't be just a scary flick. Sweet! The Muppets Feel The Hunger Spoof Trailer. Oh yeah, Hunger Games, in your face! lol. Dark Shadows Trailer! Looks like it's meant to be a SPOOF remake, like so many others have been of late. In that vein, it looks awesome! Rachelle Gardner also talks about How Authors Can Effectively Use Goodreads. Their advertising module is pretty easy. I've used it before. 12 Things That Will Kill Your Blog Every Time by Neil Patel at SEOmoz. Great Not To Do (and what to do) advice! From Chuck (NSFW) Wendig - 25 Things You Should Know About Creativity. Shot Through The Heart: Your Story's Throughline by Chuck (NSFW) Wendig. Always good stuff! And colorful! Hee! Ack, past my time slot and my eyes are shot. Feel free to share anything awesome you've run across! I'd like to thank my ever horrifyingly bigger Twitter stream for giving me all this fodder to share. I don't do so often enough.